Hello there Paper Peeps. It’s 0 dark thirty Tuesday morning and I’m between getting DH off to work and waking up Teen Peep 2 for School….in my house we call that Mom Time : ) A little Facebook, a little email, a little Pinterest. 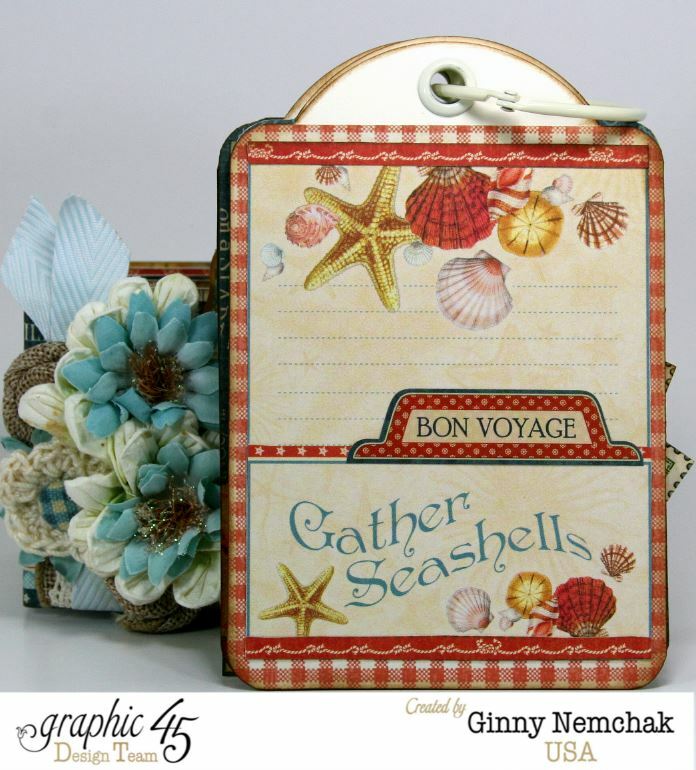 I’m also here to share a fun tag album in a box I created with the By The Sea Papers from Graphic 45. Happy Monday Paper Peeps. This is a very special day for me as I am sharing the first pics of my new studio : ) There are quite a few pics here…so maybe a cup of coffee or tea while you browse? 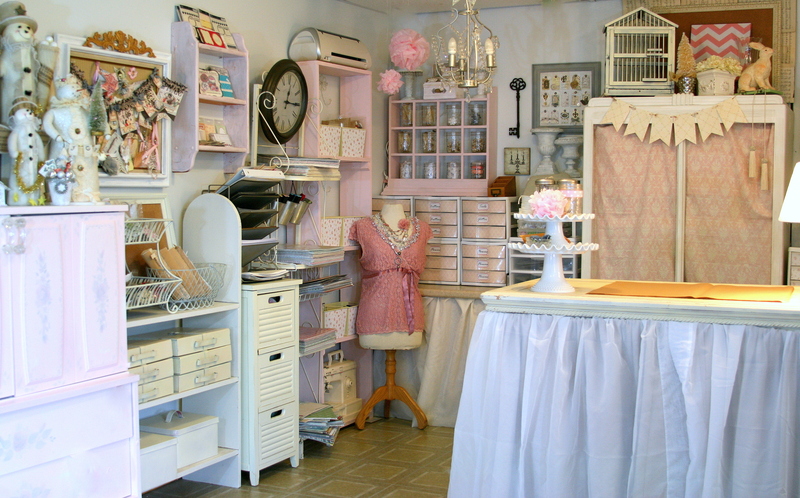 I should mention that I only moved my studio home from my shop just about 2 weeks ago….I’ve been a busy busy girl! 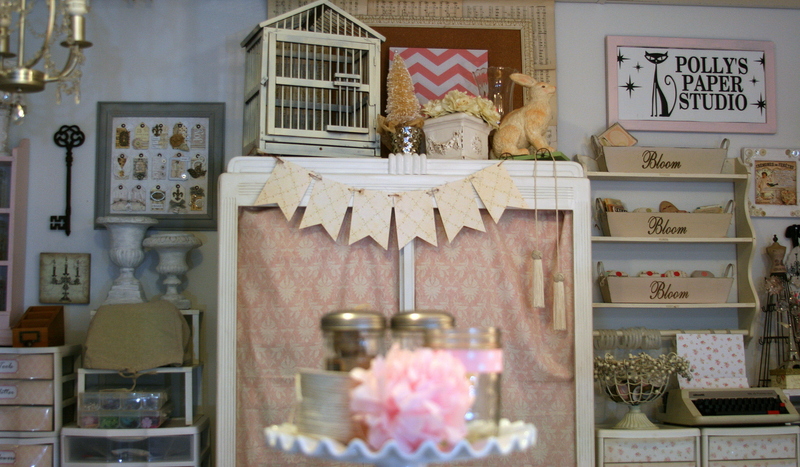 I’m calling my decor theme shabby chic….but I should probably call it…use every square inch lol. This is the back wall. 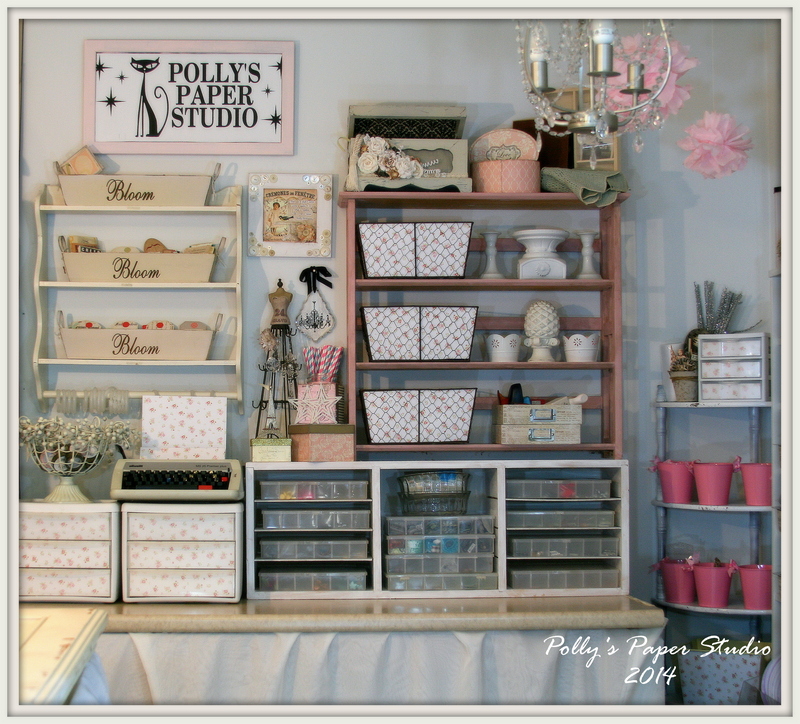 I have utilized as much vertical space as I could with little vintagy shelves that I added baskets and bins to hold punches and tags and such. 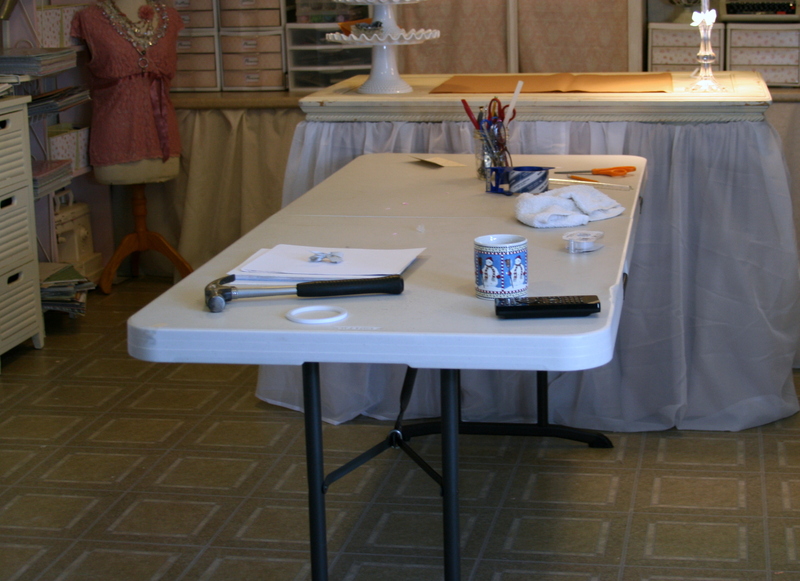 My DH created the table in the front by removing the legs off an old coffee table and adding new legs measured to be the perfect height for me to work at standing up : ) This serves as a fabulous wrapping station for orders as well as where I can do most of my paper cutting. Stella the dress form stands guard in the corner. More little shelves hold mason jars full of tiny brush trees, lace and various trimmings. 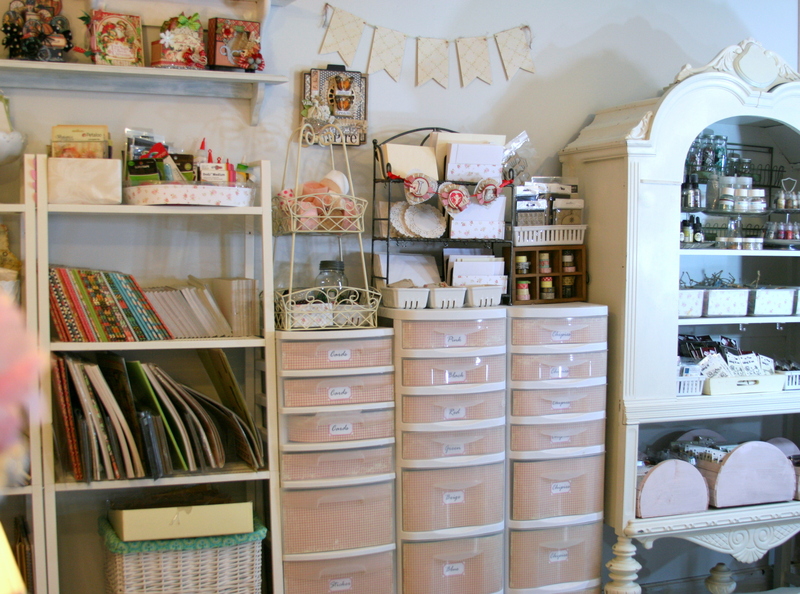 I super love those little drawers…..so handy to keep everything easy to get at but out of sight. 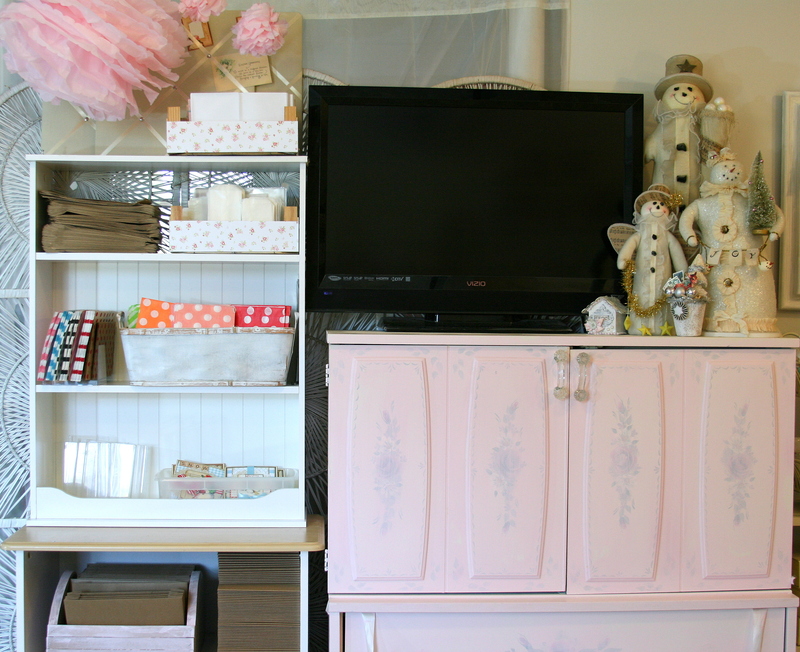 I used some cardstock on the inside of the drawers to hide the contents and to make them a little more coordinated. 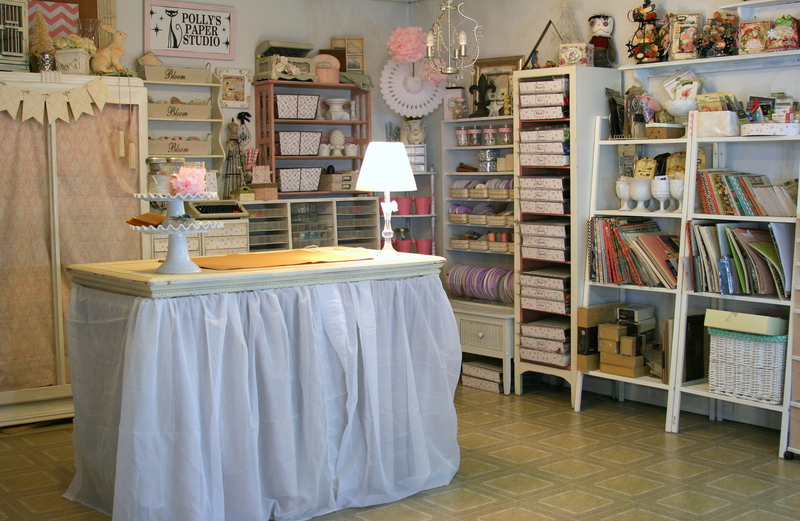 Under the skirted counter top is storage for large bins of frames and such. 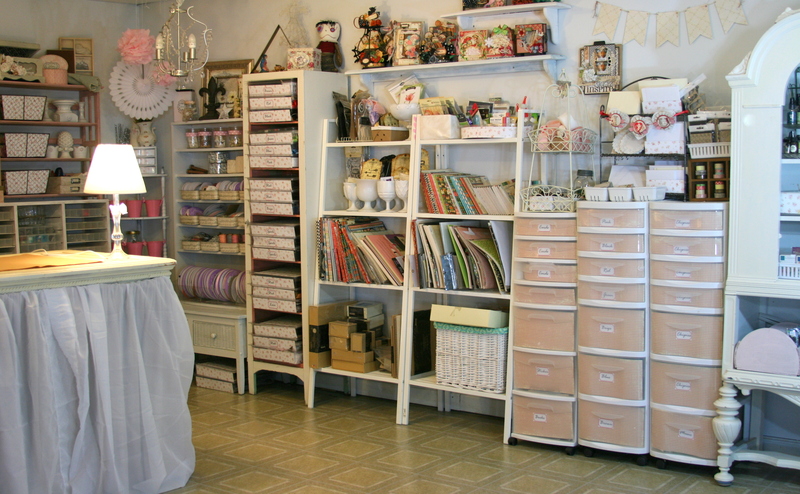 Looking toward the right side is most of my ribbon, little bins of embellies and punches. More drawers for a ton of storage. Most have labels….the 2 that don’t are flex drawers…for whatever I need I in them at the time. 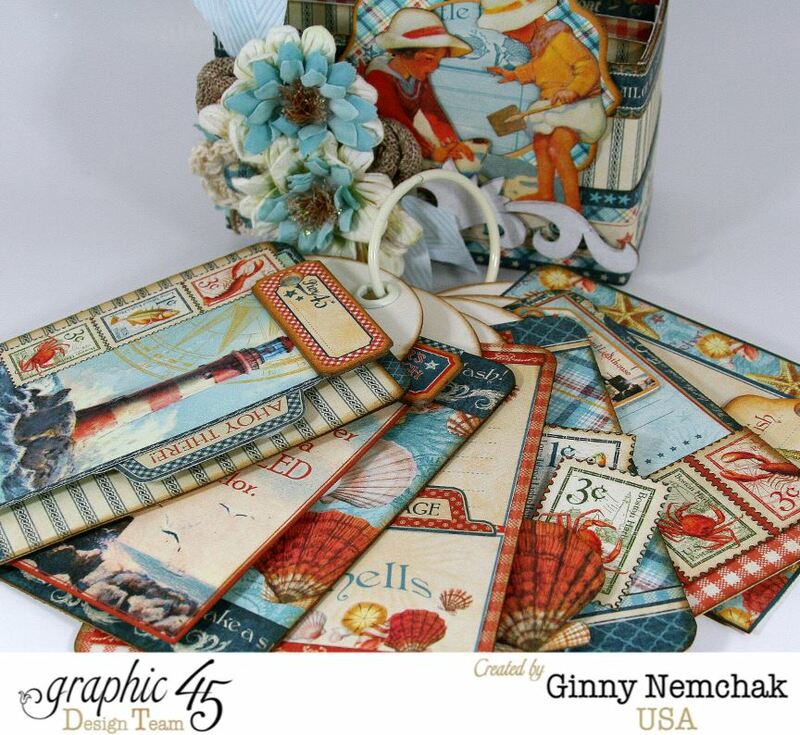 Here are 2 racks full of amazing paper crafting supplies from Graphic 45. Can you even believe how generous they are???? 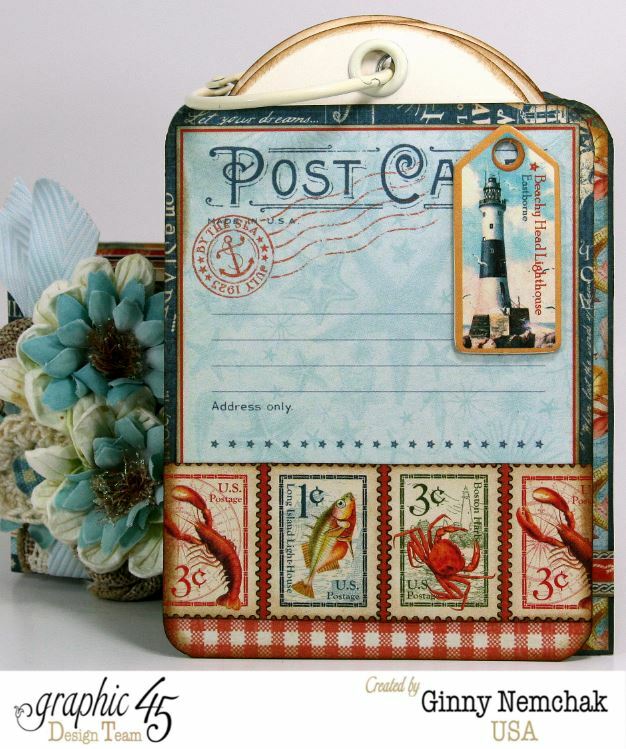 I have all the paper pads stored with the coordinating stickers and chippies so they will be easy to use. 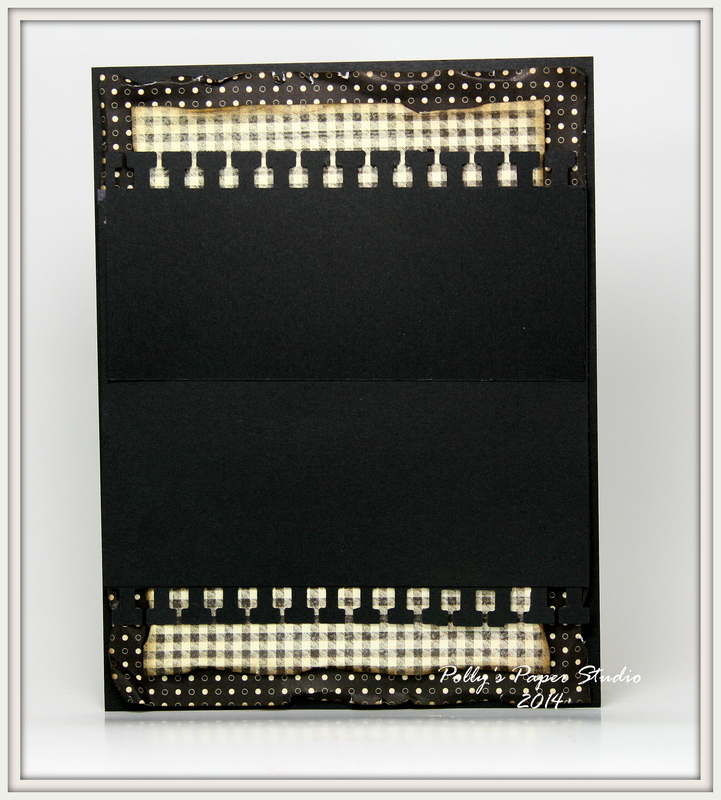 A separate shelf holds the 8×8 and 6×6 inch paper pads. 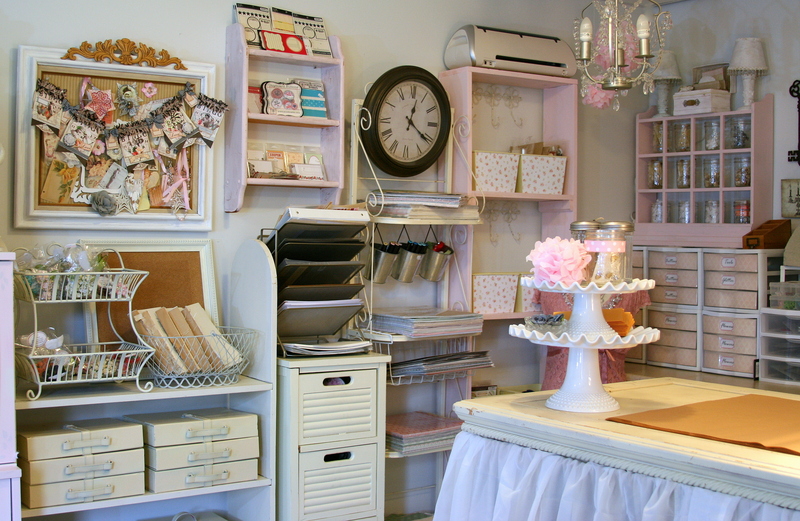 All the metal staples and stamps have milk glass or look alike containers as well as the flower dies on the top shelf. There’s a great bin of adhesives stored so I can just move the bin to my work table when I need it. 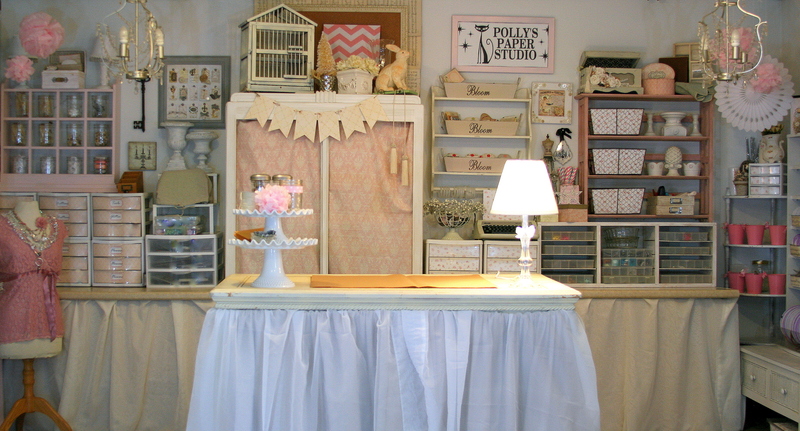 Here is the frankenfurniture I referred to a few weeks back…I added an old cd rack to a small coffee table and painted them to match and voila…the perfect display for spools of ribbon and twine, and more mason jars filled with paper pretties. I have displayed some vintagy treasures along the top. At the end of this wall I have a pretty hutch. 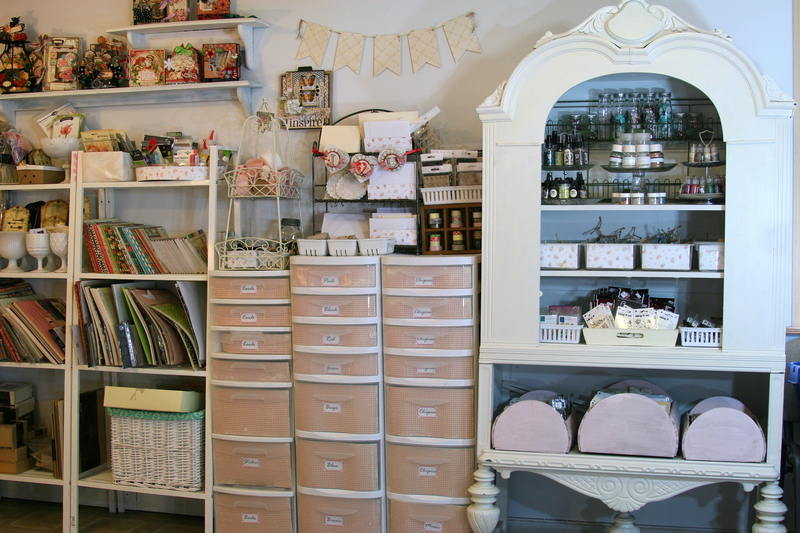 Better view of the inside of the hutch….as you can tell I love me some bins! There’s flowers and bling and brads along with my Stickles, sprays and glitters. 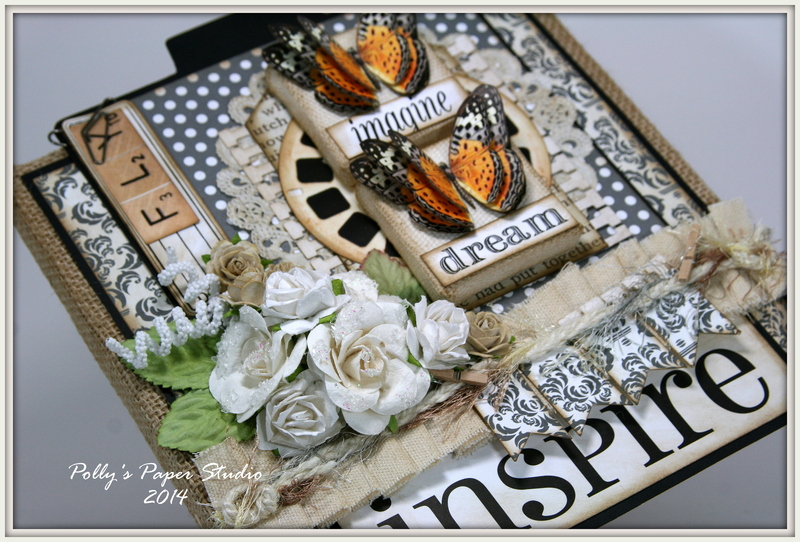 I’ve stored my blank cards and envelopes on a cute little rack with a banner. 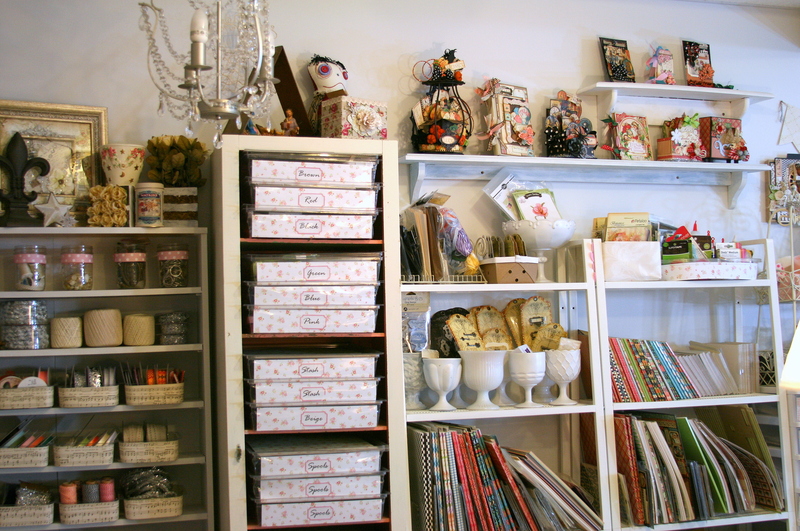 There is also a fun little stash of washi tape and Dusty Attic chippies. IN the taller rack I have pretty crepe papers, and bits and pieces that didn’t find a home somewhere else…like the 10 rolls of chapstick I have gathered from various other locations. I found the white ceramic berry baskets at Cost Plus world market a few years back..just love em! A few packaging essentials on the wrapping table. I have them on stacked cake stands. 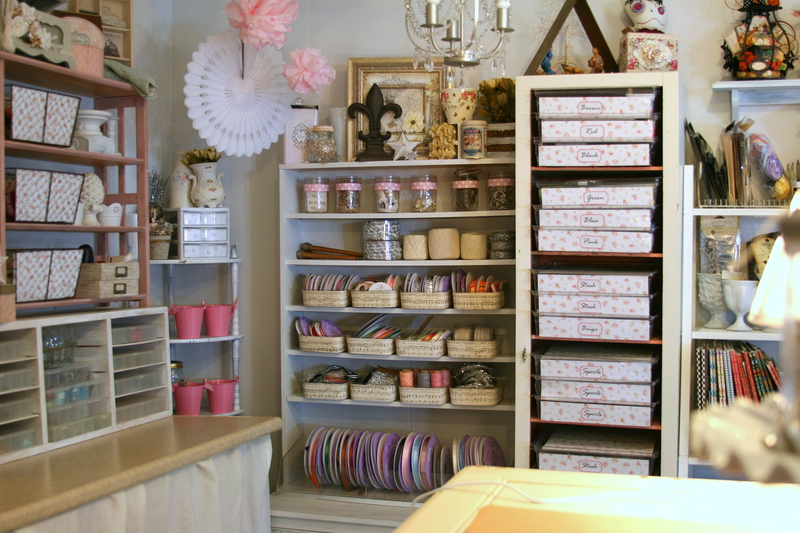 I’m using these bins to store my ribbons from Really Reasonable Ribbon that are not still on spools. 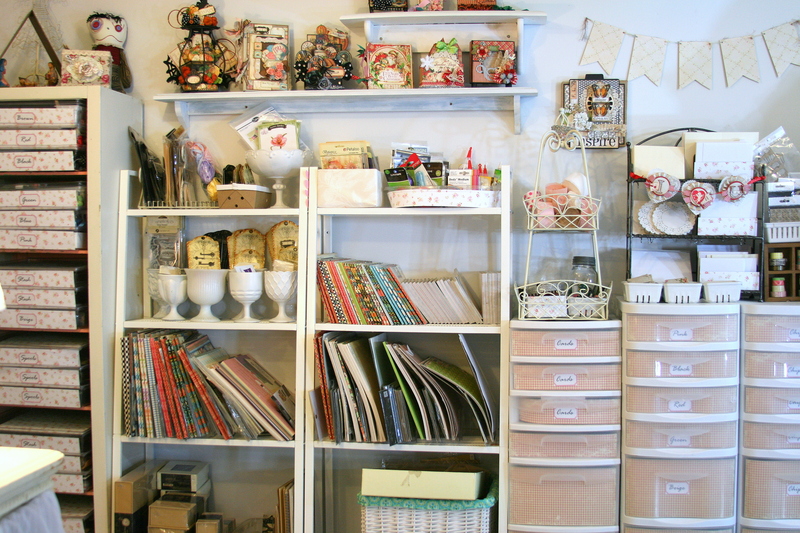 There are a few bins for stash items and for works in progress so I can keep all the supplies that I need for it together. DH built this narrow shelf for me to store my Cricut and sewing machine handed down from my MIL. The rest of the shelves have more bins. 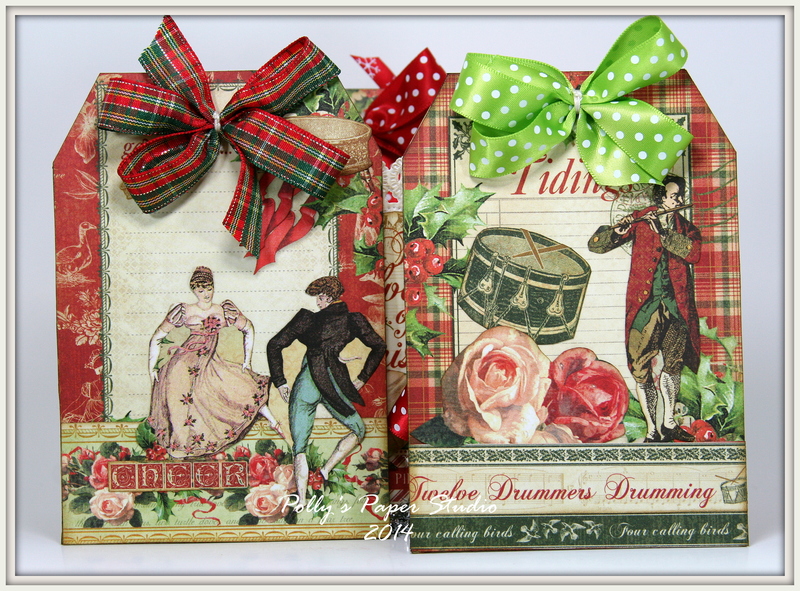 I covered the fronts with paper that has tiny flowers. 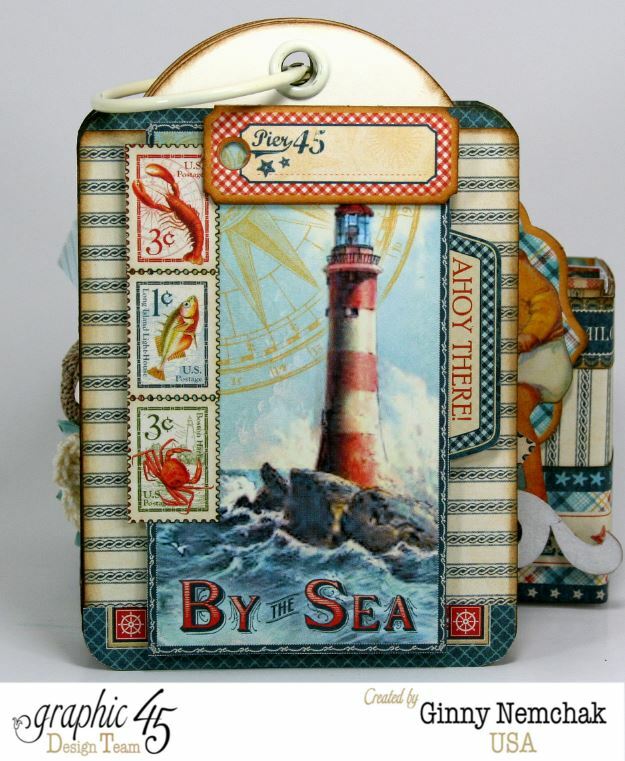 I would really love for it to be Cath Kidson….but this is what I could find on short notice…I can always add it later right? 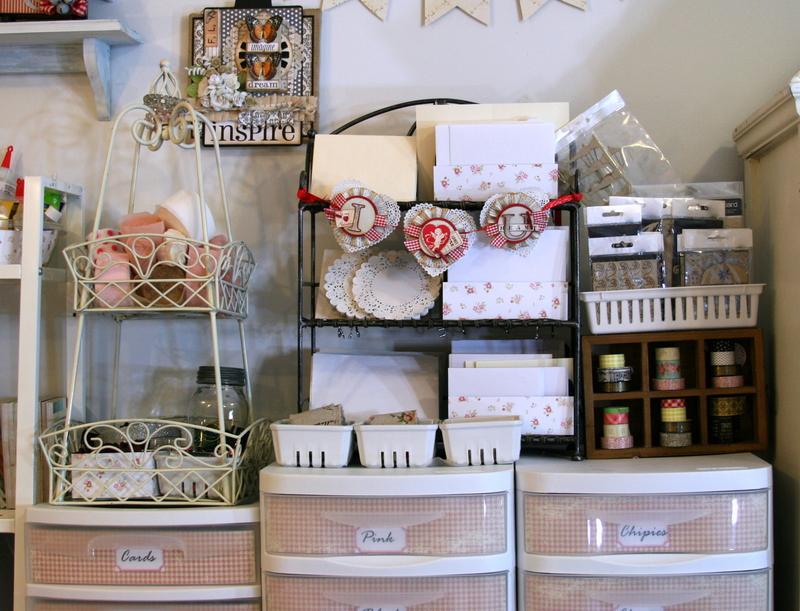 Next to the pink shelf is a narrow bakers rack that holds paper that was specially ordered for kits. The hanging metal bins hold my meager little collection of markers…..all 10 of them lol. On the drawers is a handy place to keep my carstock and a binder to hold post office receipts. 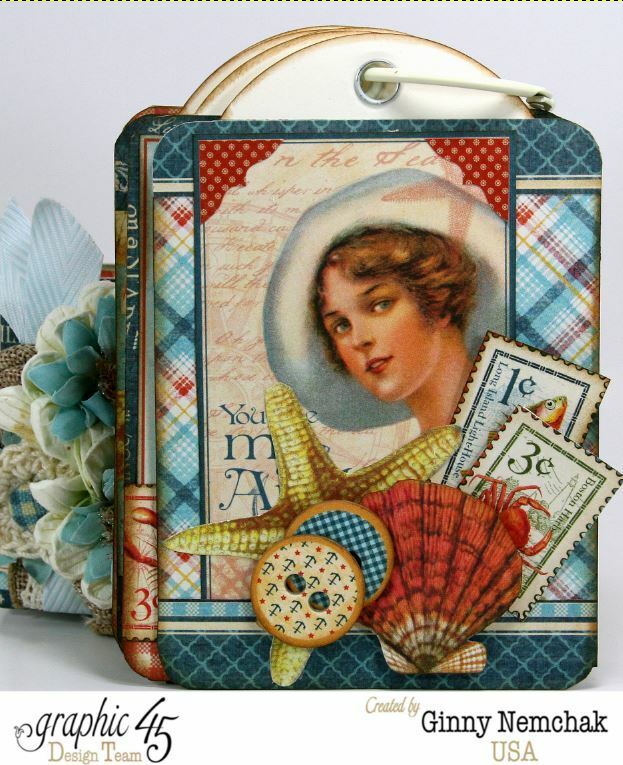 Above it is Jenni Bowlin paper pretties : ) You can also see my inspiration board hanging over a rack of Mulberry flowers, vintage books and small suit cases..which are actually empty…guess it’s time for more supplies? 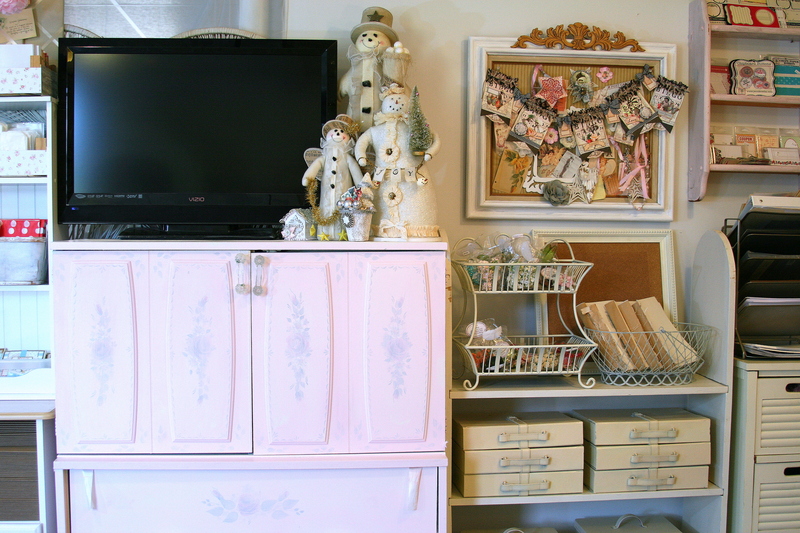 I added a lovely little fabric panel to the inside of this hutch. I got the fabric at our local quilt shop…don’t tell Jennifer I hung the fabric inside out after all she did to help me find the right pattern lol. 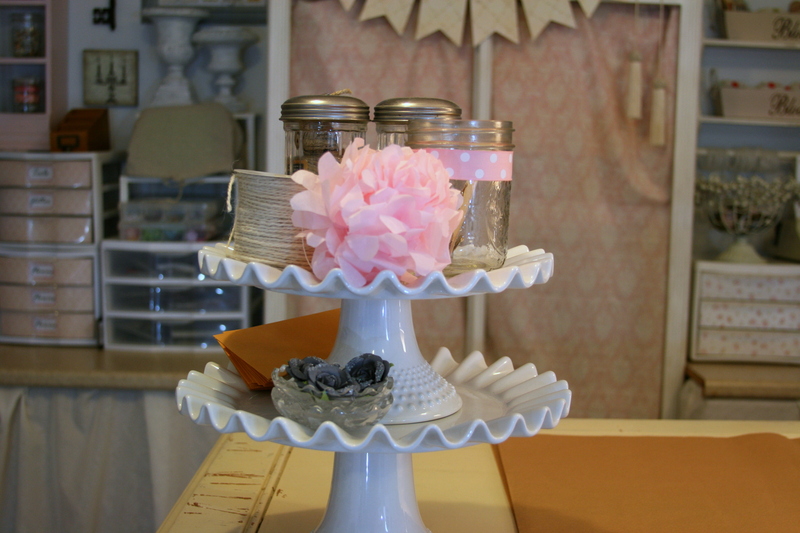 There are a few newish pieces picked up at Jennifer’s mini garage sale….don’t tell DH. Under that burlap is my die cutter….that little diecutter cozy is actaully a liner from one of the baskets…it fit almost perfectly and hides the green machine! Inside the hutch is my own personal paper supply to keep it separated from the shop stock…and various necessary but not pretty tools and supplies. As much as I would like you all to think that I create art while listening to classical music and having philosophical and intellectual debates…I am in fact listening to tv programs. Yep my cover is blown. I have no idea what the actors look like as I am only listening lol…but hey..it keeps me from talking to myself…most of the time. I tried to capture this shelf where I store my shipping supplies to look nice…..I arrived at organized..not sure it looks nice??? But it does hold my little bags and boxes. 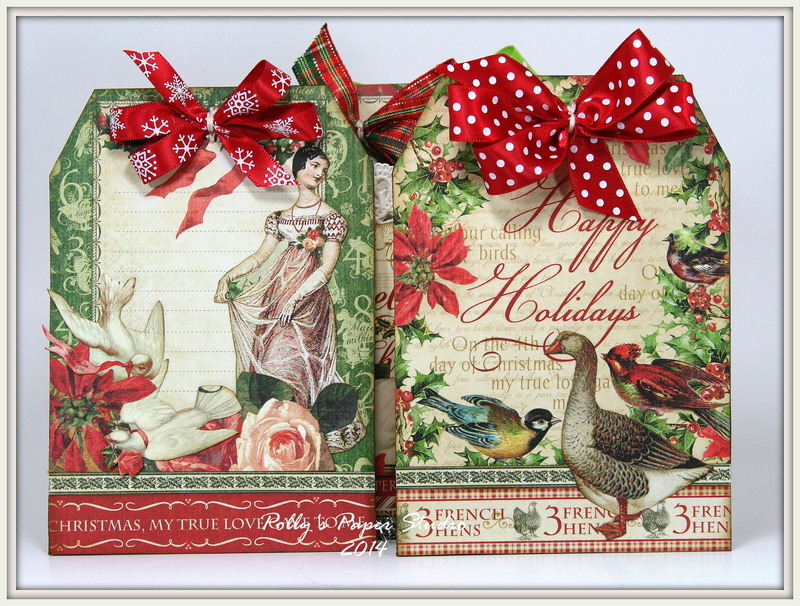 If you are an Etsy Peep….you will be familiar with these packing pretties : )DH has been collecting vintagy snowmen for me over the years…I can’t bear to put these 3 away..I do love them!!! Hey there Paper Peeps! 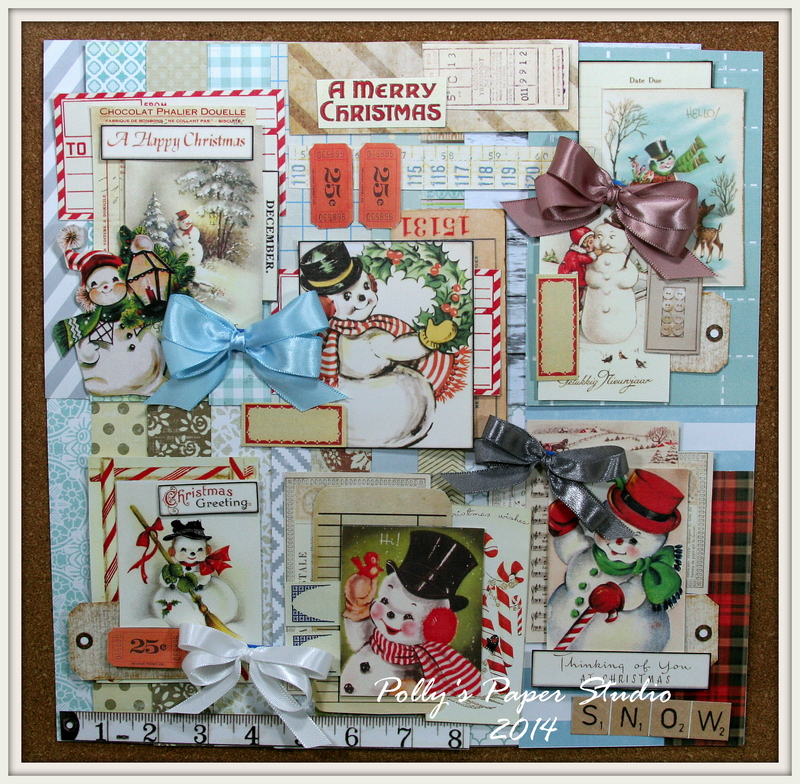 As promised I’m sharing my projects created with snowmen!!!! I know…you’re saying to yourself…but Ginny you hate snow. So true my friends…but I do love snowmen. With their sweet little faces : ) Okay enough blathering…on to the projects! 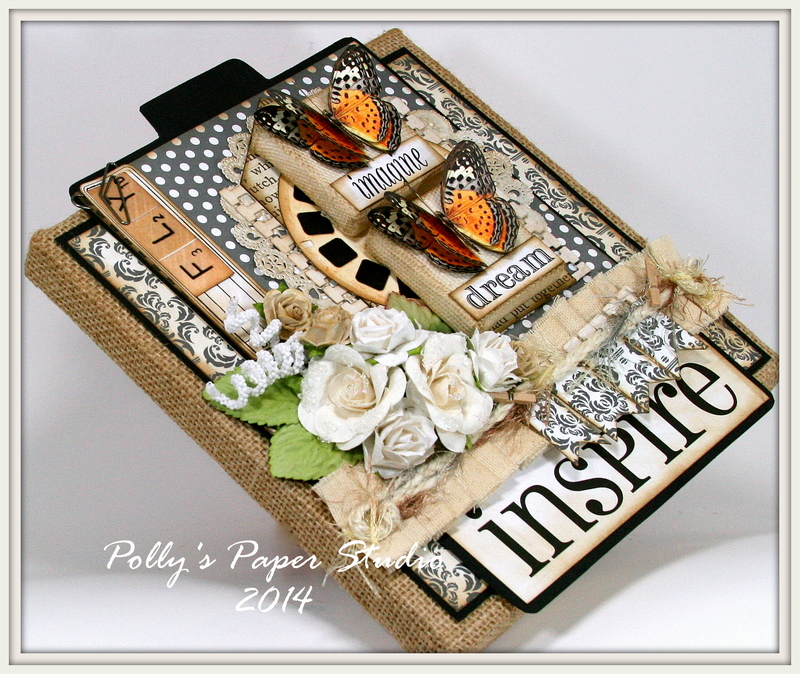 Visit the Polly’s at Etsy shop to get an itemized list of all the paper pretties in this kit. Well hello there Paper Peeps! I’ve got a special project to share today. 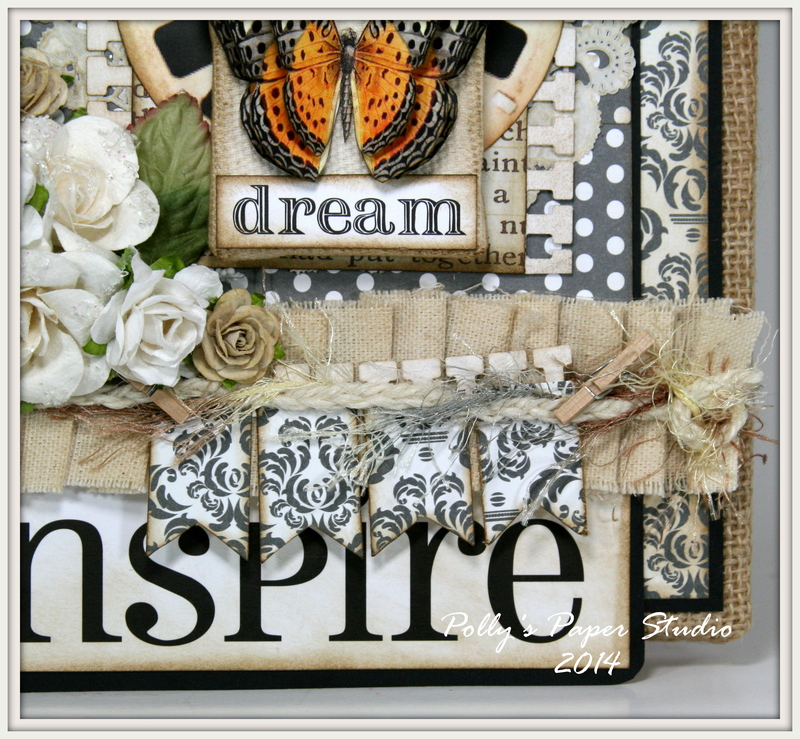 I’ve created an altered art canvas to hang in my new studio space….just a little something to inspire me while I’m working. 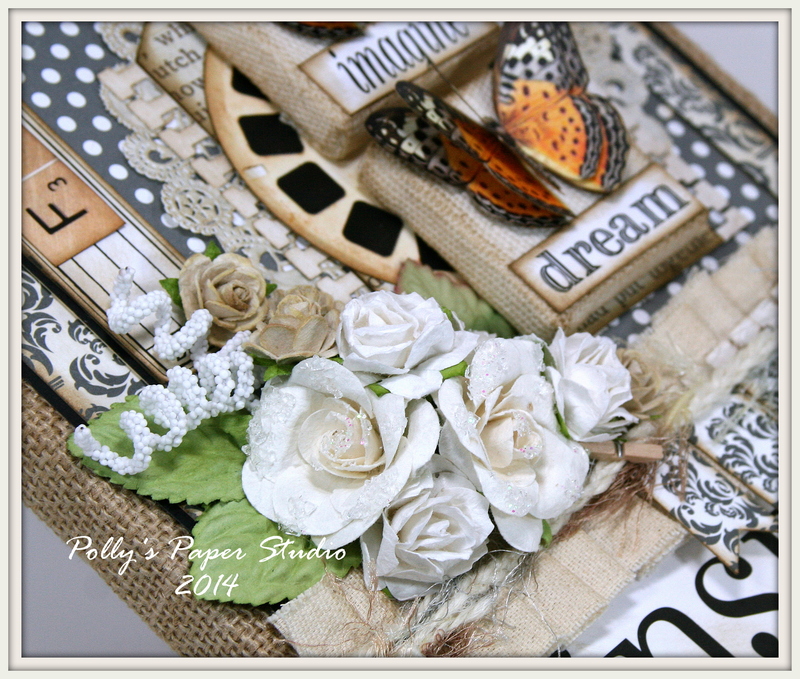 I used lots of fabulous supplies from Canvas Corp and 7 Gypsies. I’m quite thrilled at how dimensional it turned out. 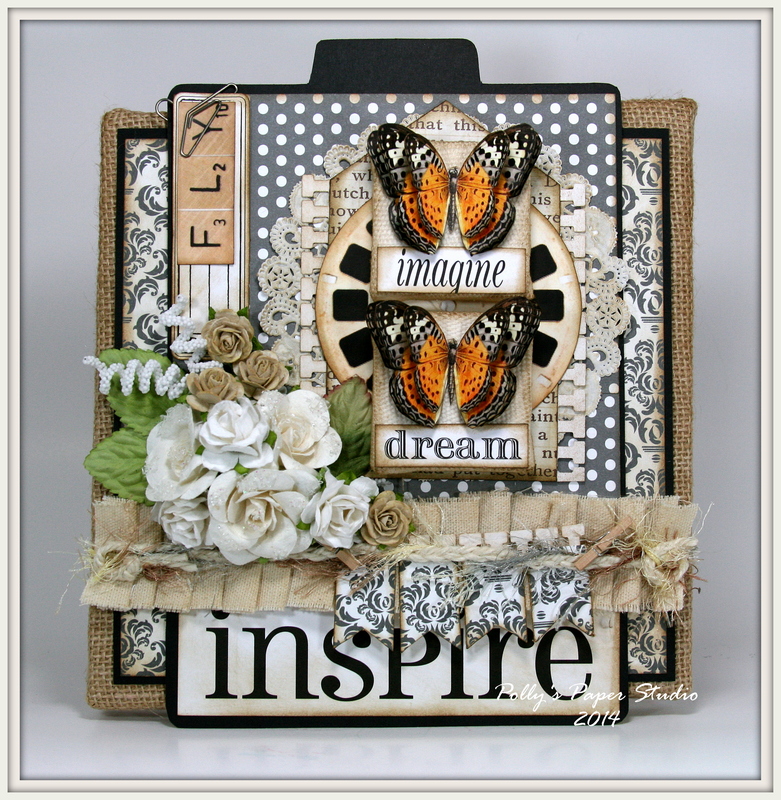 I added fussy cut butterflies and some inspirational words to the little frames then layered them over lots of paper pretties that are well inked of course. There’s about elebenty hundred flowers here and some Spiral Stamens from Really Reasonable Ribbon. 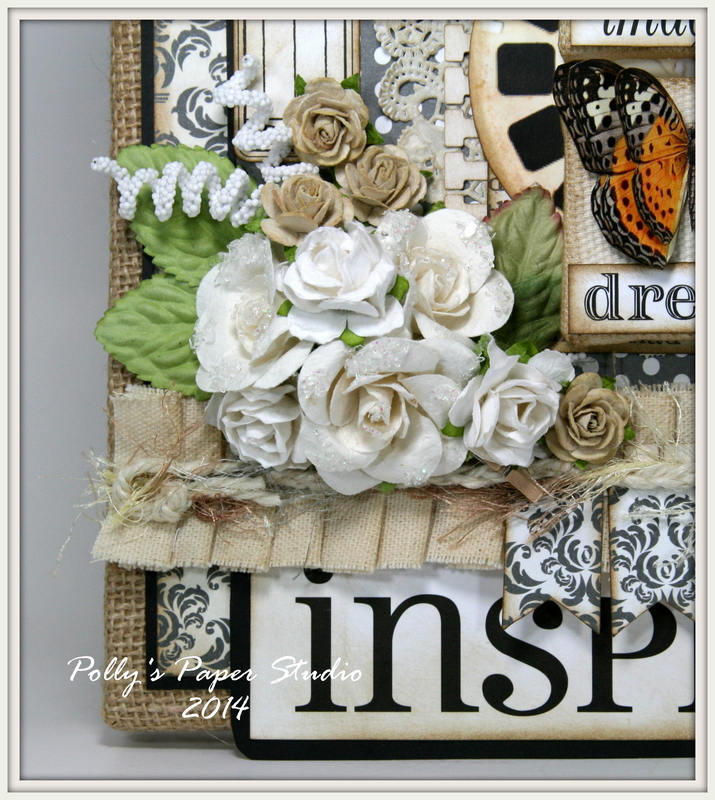 I pleated the canvas trim and added a fun little banner. There’s also some pretty braided twine and eyelash yarn to hide the seam. Look at all those yummy layers!!!! Hey there Paper Peeps. 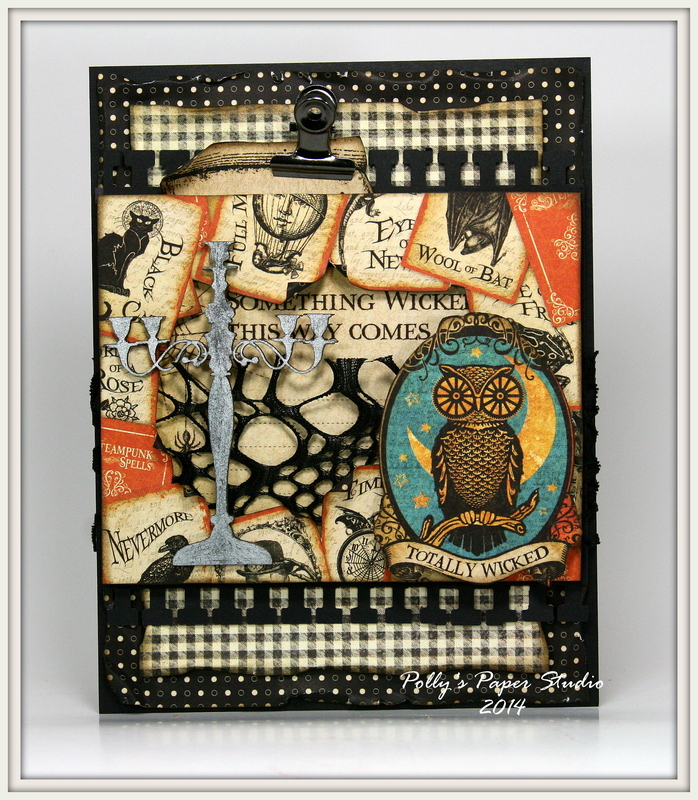 I’m having myself a good ol time creating Halloween projects and today I’m sharing a tutorial on a fun and festive card with Steampunk Spells from Graphic 45 and Really Reasonable Ribbon. 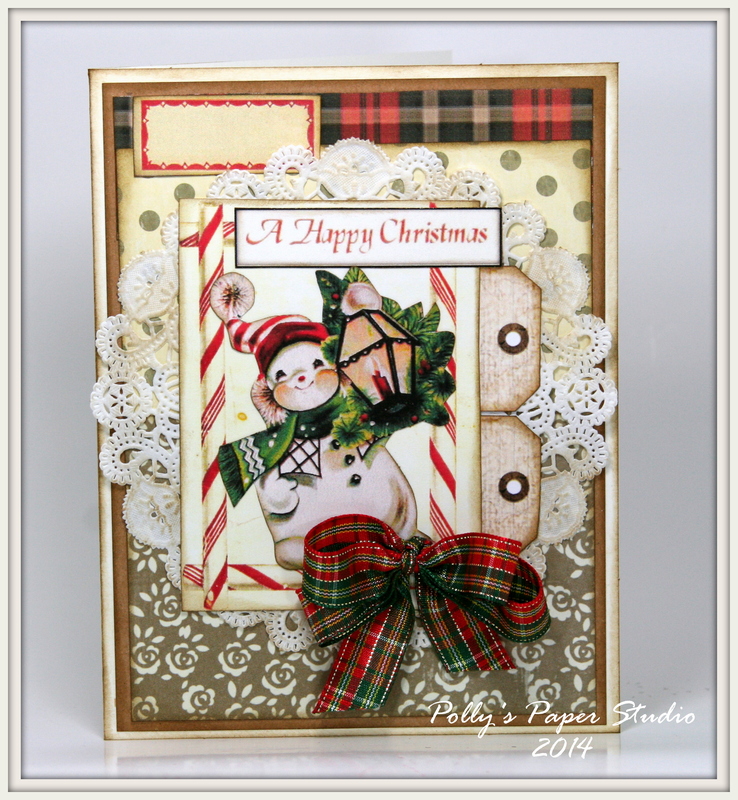 This card has lots of texture and layers! And of course fabulous trim from Really Reasonable Ribbon. Okay…here’s how I made it…. 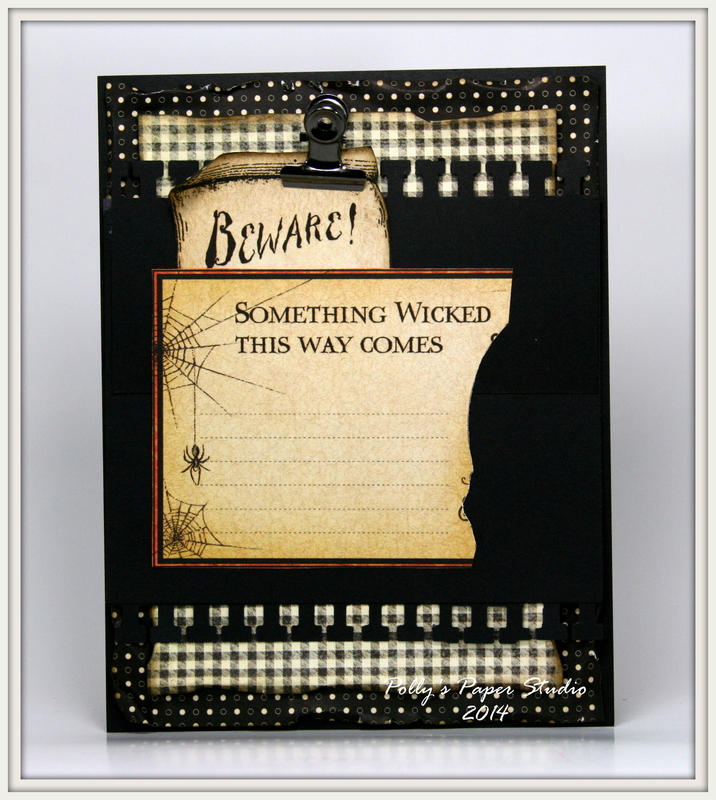 I started with black cardstock and added the very scrunched and inked patterned paper with just a tiny weeny little border showing. Another layer of patterned paper. 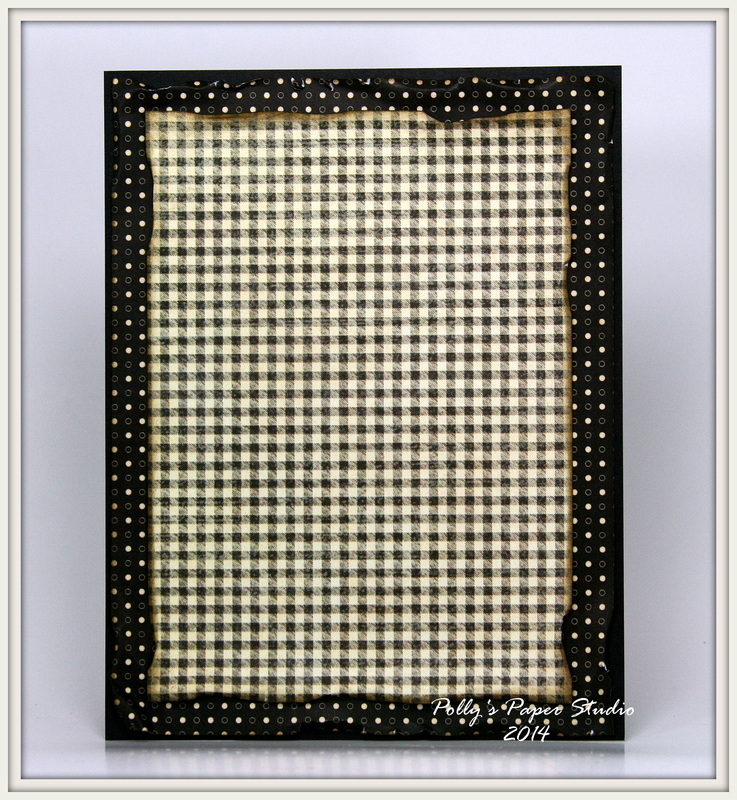 This time it’s Pitter Patter from Graphic 45. My new favorite. 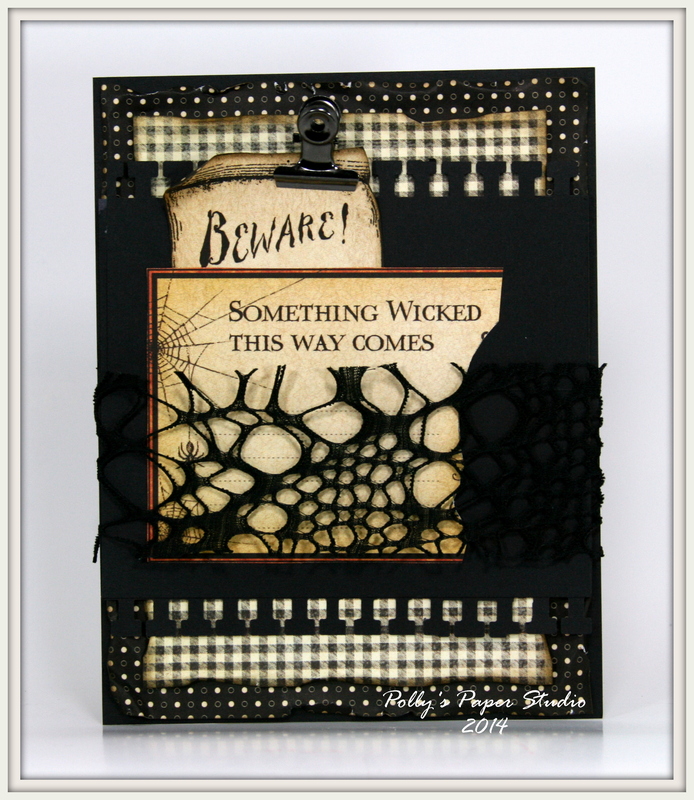 Next comes a layer with a punched border. Coupla pieces cut from the Graphic 45 Steampunk Spells paper. 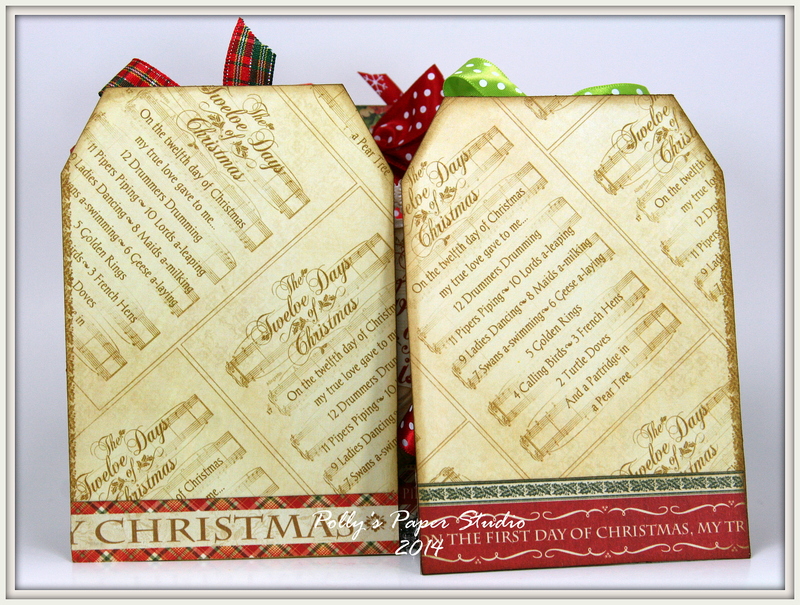 Wrap the Black Webbing Ribbon around and secure on back. Frame adhered on foam spacers for dimension. Add owl image to right corner of frame. 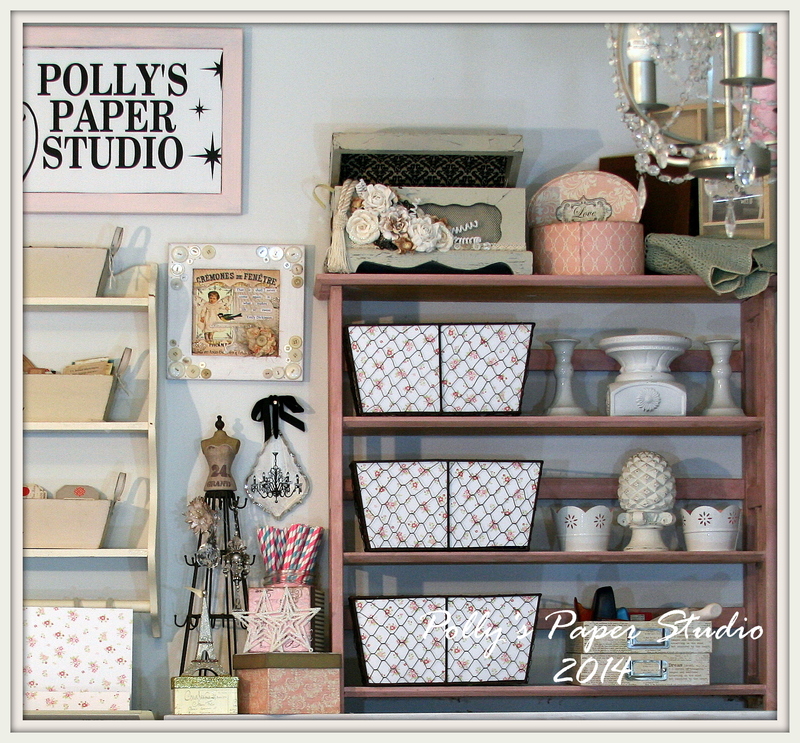 Painted Dusty Attic Chipboard candle stick on the left. 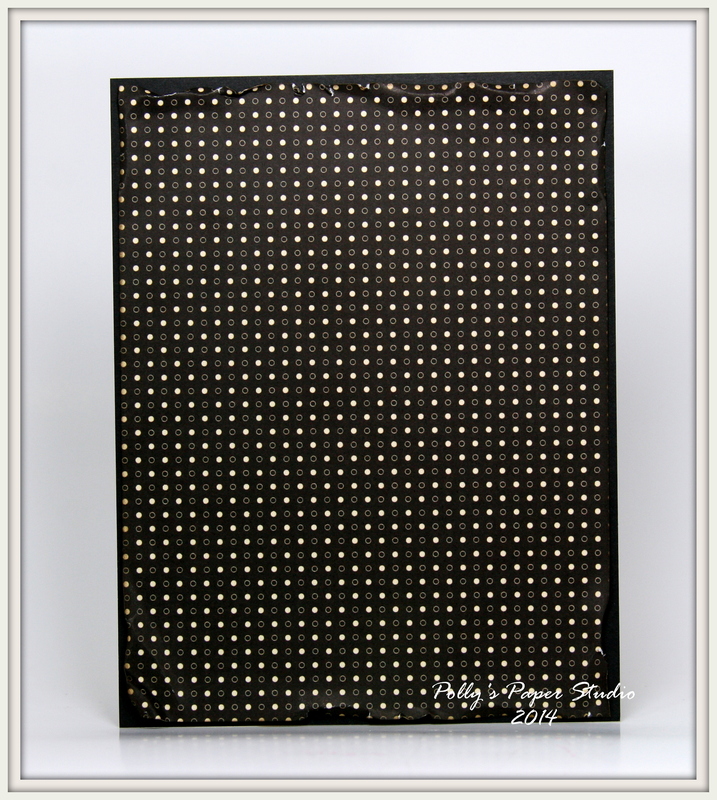 The perfect finishing touch is a nice poofy bow of Swiss Dots on Black Satin Ribbon. Well Peeps….I’ve had a morning without internet service….nooooooo….insert blood curdling scream here. It’s been like some kind of torture. So what do I do when I’m down for the count? Digital collage of course. To justify the elebenty hundred images I have saved to files…that’s what I’m gonna tell DH anyway! 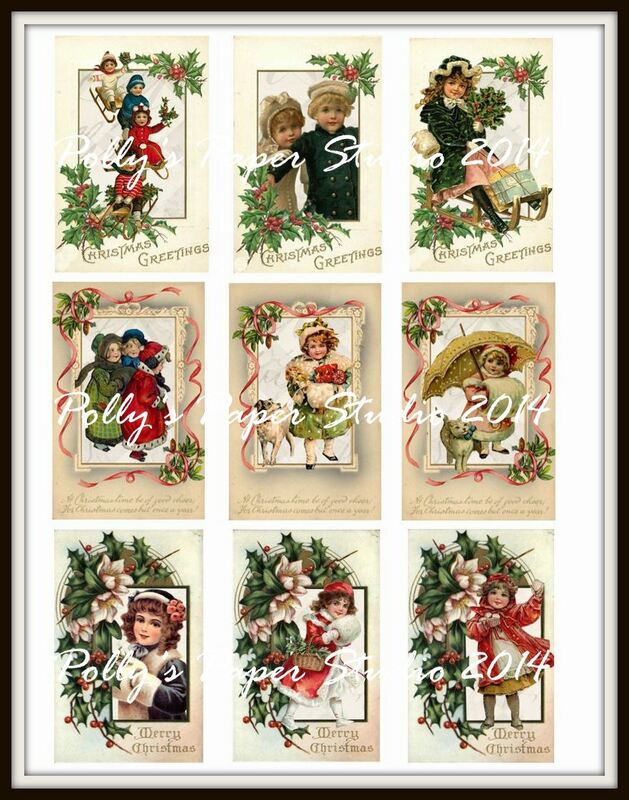 For your viewing pleasure I present Vintage Children Christmas Postcards. 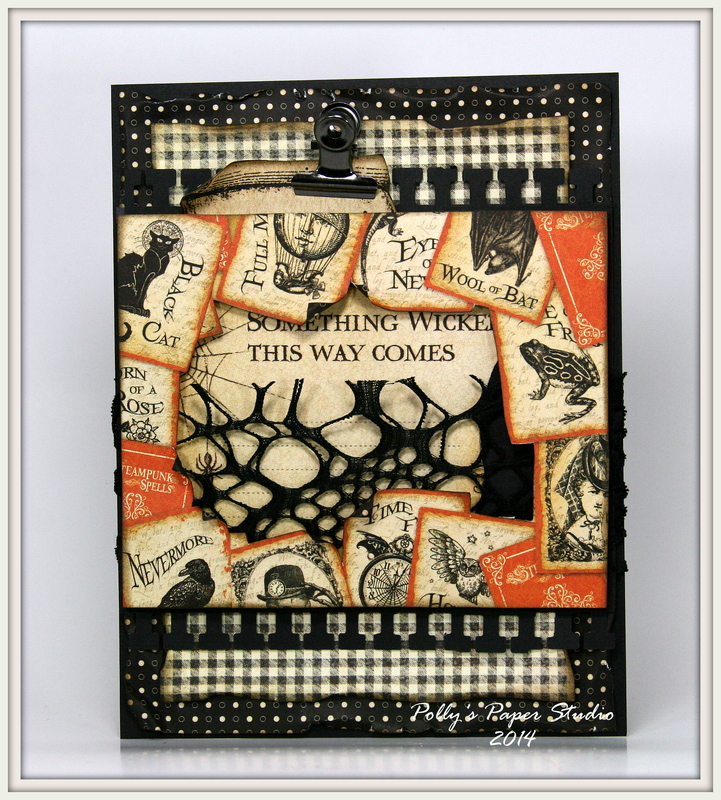 And last but not least….50’s Retro Halloween Tags. Well hello there Paper Peeps and happy Sunday! 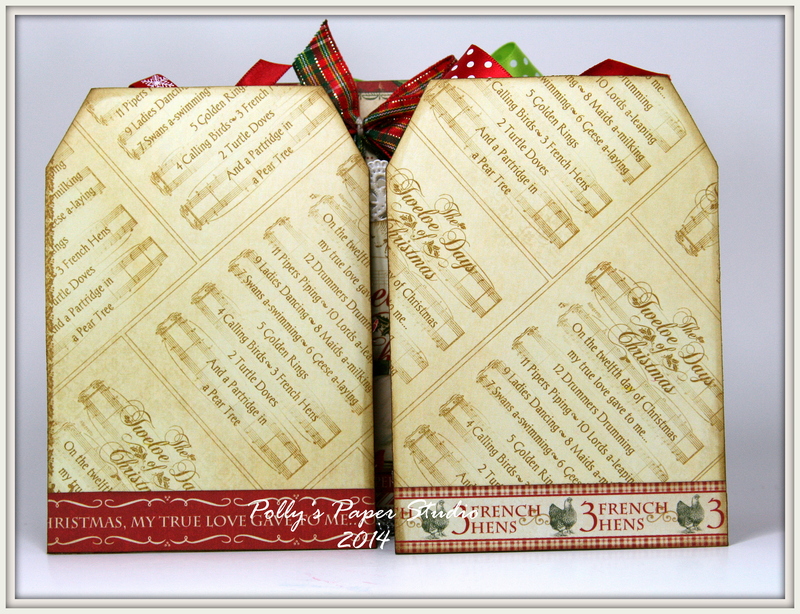 I’m super excited to share the much requested Christmas Tag Book in a Box. 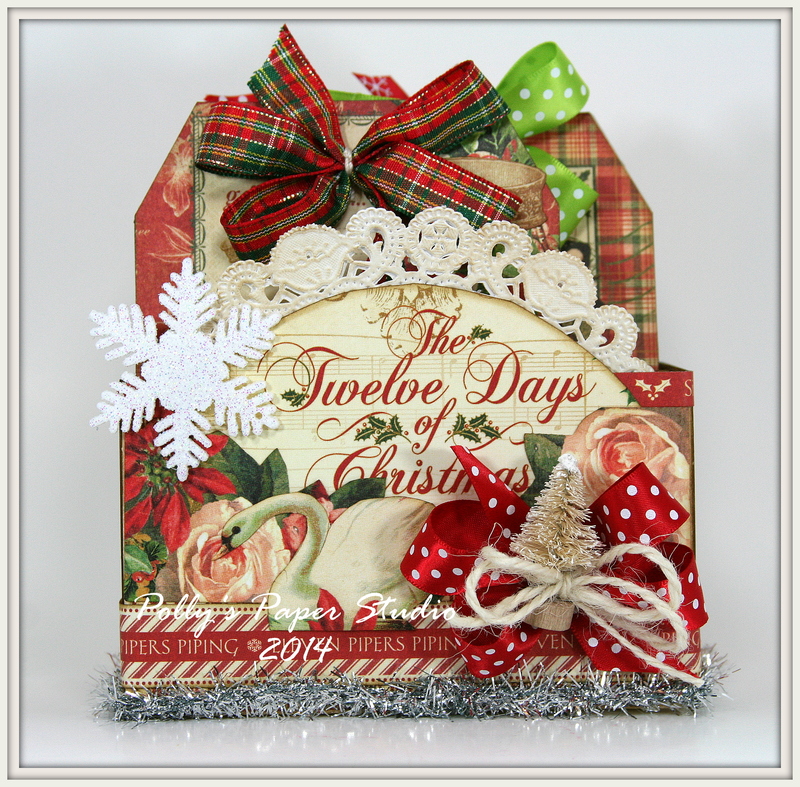 The Halloween version was gone in less than a day and I was so sad that not everyone could get one : ( For this kit I used all Graphic 45 Twelve Days of Christmas Papers and let me tell you it was so great to work with the fabulous vintage images and patterns! 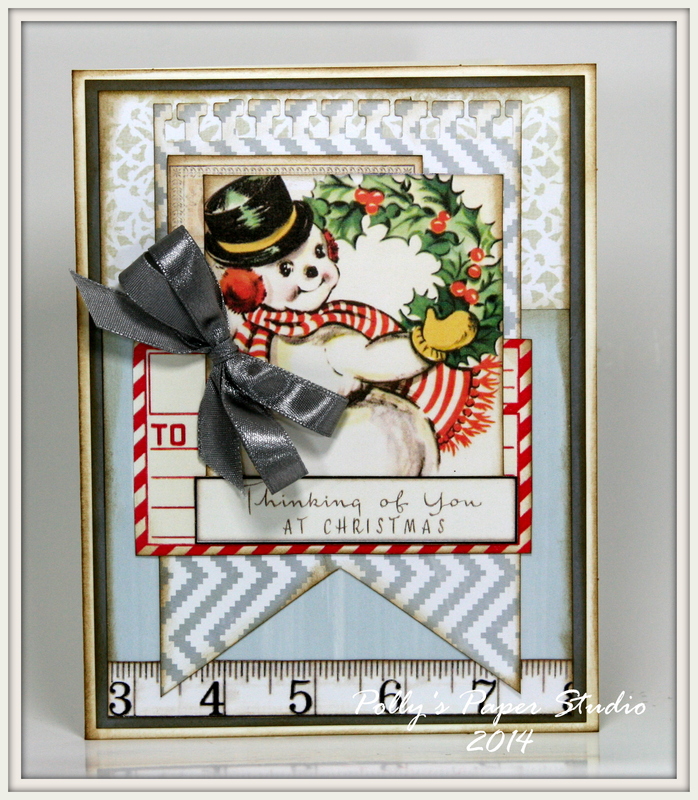 Of course I added beautiful trims from Really Reasonable Ribbon and fun embellishments…because that’s how I roll Christmas style! So I’m thinking there are like a million uses for this box right??? 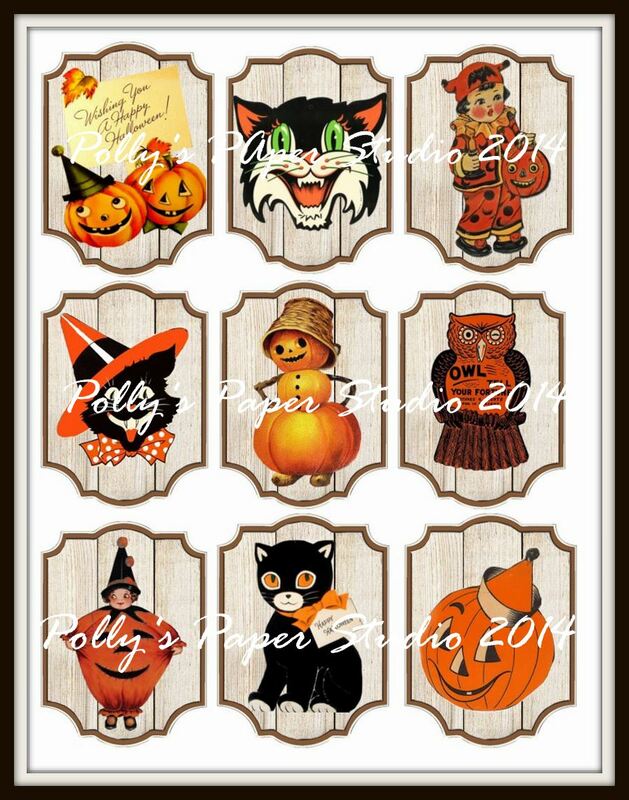 Add pictures and memories and display with your favorite seasonal decor. 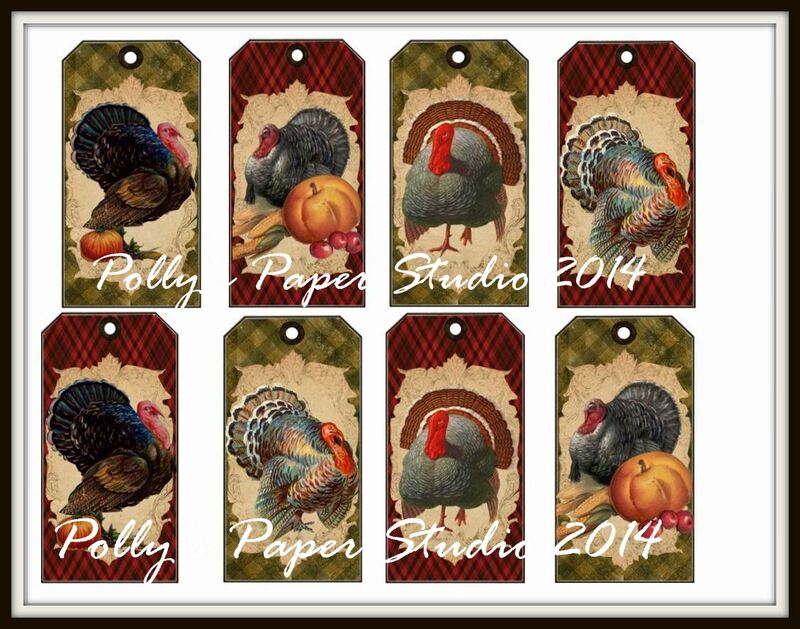 Add gift cards to make it a personal family gift or add cards with your families cherished holiday recipes! 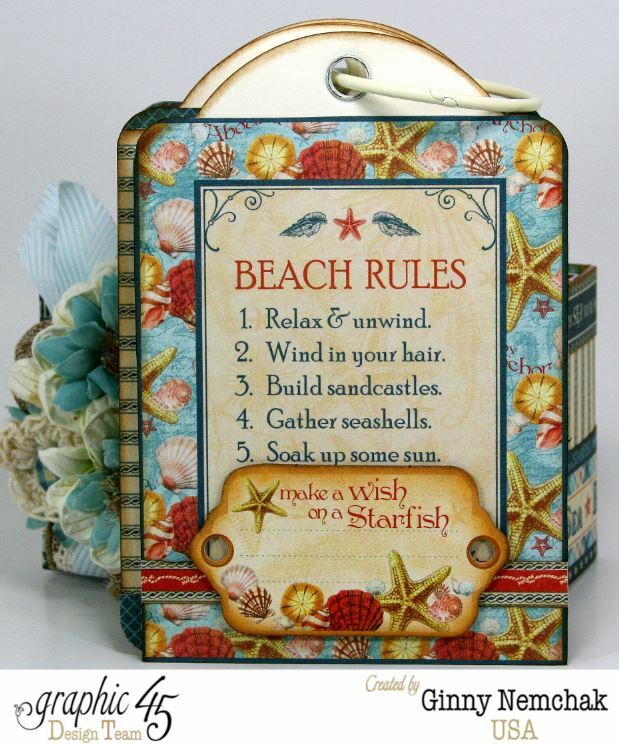 This would be a fabulous gift : ) Just sayin!